Weave Pole Set - 30" poles with a free-standing base. Standard 6-pole set. Colored vinyl tape - for decorating all the poles. * 6-Pole Weave Set - Features a free-standing base that is easily moved from one spot to another. Poles are 36" tall. Specially engineered supports are positioned in such a way as to never be in your dog's way. Poles can be custom decorated, so the markings are eye level with your dog. * Bar Jump - Practice Bar Jump features an adjustable top bar and for safety, the top bar displaces when contacted by the dog. The bottom bar is fixed for stability. Decorate the top bar with the free red and blue tape, included with Agility In A Bag set, to draw the dog attention to it. * Tire Jump - This Practice Dog Agility Tire Jump has a 24" diameter hoop that adjusts in height by sliding up and down on the side bars. 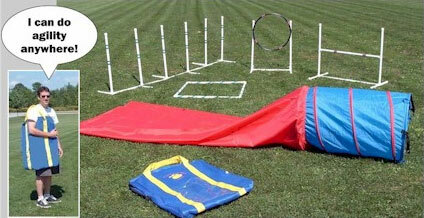 * 3' Tunnel - Practice Agility Tunnel is 22" diameter. It's made of rip-stop nylon so it resists tearing from dog nails. Use this event with or without the attachable chute. Has tie down stakes for the ground to improve stability. * 8' Chute - This Chute attaches to the tunnel with Velcro and elastic making the tunnel a different event entirely for your dog. The Chute is also made of rip-stop nylon to resist tearing. Colors are subject to availability. * Practice Pause Table - Simulate the sometimes hard to master event in your yard or practice in the house for maximum training time. * Carrying Bag - This is a sturdy zippered canvas bag with pockets and a strong shoulder strap that easily fits all six obstacles and can then be slung over your shoulder for that trip to the park. * Assembly instructions for each event, includes decorating tips and tricks for easier future assemblies. * Training Manual - Includes photos and training tips for each obstacle. * Free red and blue tape to decorate Agility-In-a- Bag just the way you like it, for both safety and to make it pleasing to the eye. 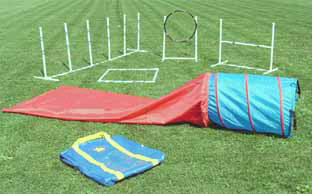 * Tie down stakes Included with the Practice Dog Agility Tunnel. All six obstacles in the Agility in a Bag set are adjustable and can be used with any size dog, and can be used indoors or outside. Below are some commonly asked questions and shipping information about the Agility-in-the-Bag Set. Drop us a line if you have any further comments about our kit- we really appreciate your input. "What is the difference between these obstacles and your other obstacles?" With all our obstacles, there are two kinds: a "Practice" kind, and a "Competition" kind. The obstacles that are in this "Agility-in-A-Bag" set are slightly below the standards of the practice kind. The main difference is the thickness of the plastic pipe that is used...because the obstacles need to be carried around in a bag, the pipe we use is thinner and more lightweight. But don't be concerned...it is not so thin that it cracks easily! The pipe is still very sturdy and it would take some brute strength to break it. The other difference is in the design of the obstacles. The changes are minimal, but constructed so that the minimum amount of pipe is used, yet sturdy enough to stand on their own. But because they are more lightweight, we suggest packing up your obstacles after each use. Not so much because of rain, as they can get wet, but the wind. This is not necessarily necessary with the practice kind, and definitely not with the competition obstacles (which are generally much heavier and sturdier). The tunnel & chute is made of rip-stop nylon. The tunnel is 3' long, which is short, but most dogs don't have problems with the tunnel, and love it regardless of how long it is. It is a great size for using inside, and of course, more portable. You can use it alone, or add the 8' long chute to the back end of it to make it a "closed tunnel" obstacle. It has a 22" diameter. Competition tunnels are 24" diameter. "How many obstacles are included?" There are 6 "different" obstacles, but only 5 can be used at the same time. The tunnel can be used separately from the chute (which is called an "open" tunnel, because it is open on both ends), OR you can add the 8' long chute on to the back of it, and it will become a different obstacle called the "closed" tunnel, because the back end of it is "closed" to the dog. "How easy is it to set up?" Everything sets up in just a couple minutes. The obstacles simply pop together. "Can the obstacles be used for any size dog?" Yes, the can (except for some of the very large breeds, which can really only excel with competition-quality obstacles). The two jumps (tire jump and bar jump) are adjustable to any height. The 3' canvas tunnel has a 24" diameter which is the same as competition diameter. (the length of course is shorter). The weave poles are always spaced the same, no matter the size of the dog.